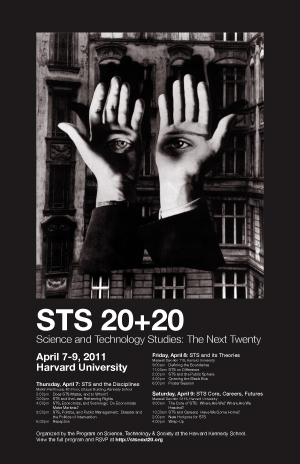 Yesterday was the last day of the Science and Technology Studies conference at Harvard, STS 20+ 20: Science and Technology Studies: The Next Twenty. As said in the previous post, the conference was hosted by the Program on Science , Technology and Society (STS) at Harvard, the group I am spending this year with. The theme of the conference was “A Meeting Reflecting on the Past Twenty Years of STS Graduate Study, and Looking Ahead to the Next Twenty” and it was terrific. I haven’t posted on the individual sessions (wanting to spend the time meeting so many people whose work I have been studying this year) but I found the meeting really stimulating, a real treat for anyone with an interest in the field of science and technology studies. As said previously, each day was broadly based around a different theme; Day One on the theme of disciplinarity (Does STS Matter, and to Whom? ), Day Two on STS theory and Day Three on the future of the discipline. In fact, all of these themes arose in almost every session. There were 3-4 sessions per day, with a panel consisting of Chair, provocateur and discussants, each of whom gave a short overview, followed by an hour of questions and comments from the audience. The ‘audience’ of course consisted of other STS practitoners from around the world – there’s something very nice about a conference where all the participants are all very familiar with one another’s work, it’s more like a big family meeting than the traditional type of conference. It’s also great to go to a meeting where, instead of participants presenting their latest work, the delegates discuss the field itself, its past present and future (at physics conferences, there are rarely more than 3 or 4 talks that I find relevant to me, or can even understand, something many scientists complain about nowadays). The first session yesterday dealt with a discussion of the core of STS (what constitutes the core of the discipline, from research to pedagogy). After the break a younger panel discussed STS careers – their own experiences of opportunities available to emerging PhDs and postdocs currently and in the future. After lunch, the topic was New Horizons for STS , where a panel considered the future of STS in terms of academic institutions. This last is a very serious topic indeed. 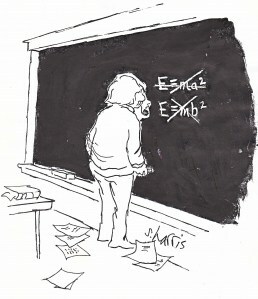 Since STS deals specifically with the analysis of the intersection of science, technhnology and society, it’s hard to imagine a topic of more immediacy; yet it has struggled to establish its own place within the academy, partly because the subject straddles so many traditional disciplines (sociology, politics, law, history and philosophy to name but a few). Just recently, it was announced that the existing STS program in Penn State University is to be dismantled, with consequent loss of positions for some academic staff. You can find a list of exisiting STS programs and undergraduate courses in US unversites and around the world here. All in all, a great conference – I wish there were more conferences where delegates discuss the field itself, it made for great discussions and a superb overview. From my point of view, it was great to meet so many figures whose work I have been studying. (A highlight was discussing Trevor Pinch’s work on neutrinos with him, and his work with Harry Collins on the Eddington experiment). I was lucky to be at Harvard the year this unique meeting took place. You can see the conference program here and slides of talks will be available in the next few days.